Walter Hagenah was born in 1919. Hagenah completed his fighter pilot training in early 1942 and was posted to JG 3. Obergefreiter Hagenah was assigned to 2./JG 3, based at Wiesbaden. On 22 April, the unit was ordered to relocate to Vienna-Aspern in preparation for service on the Eastern front. Hagenah suffered a take-off accident in Bf 109 F-4 “Yellow 4” at Vienna, fortunately without injury. 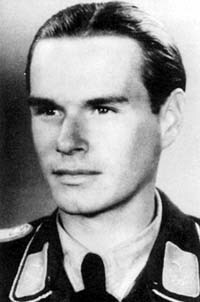 On 12 August 1942, Hagenah achieved his first success when he shot down a Russian LaGG-3 fighter. His last victories on the Eastern Front were gained on 14 October 1942, over the Stalingrad pocket, when he downed two Russian Il-2 Sturmovik ground-attack aircraft for his 5th and 6th victories. I./JG 3 was then recalled to Germany for rest and refit. By December 1943, Hagenah was serving with 10./JG 3. His 7th victory, a USAAF B-24 four-engine bomber, was claimed on 19 December 1943. On 12 May 1944, he claimed a USAAF B-17 four-engine bomber Herausschuss but had to force-land near Dornholzhausen in his Bf 109 G-6. In July 1944, Leutnant Hagenah transferred to IV. (Sturm)/JG 3, under the command of Hauptmann Wilhelm Moritz (44 victories, RK), based at Illesheim. The Gruppe was the first of several being formed to fly the heavily armed and armoured Fw 190 A-8/R8 Sturmbock fighters in an attempt to inflict heavy losses on the American bomber formations. He was appointed Staffelkapitän of 10./JG 3 when Leutnant Hans Weik (36 victories, RK) was shot down and wounded on 19 July 1944. On 30 July, he downed a USAAF P-38 twin-engine fighter for his 15th victory. In September 1944, Hagenah attended a fighter leaders’ course. He then went to Erfurt to convert ex-bomber pilots for fighter operations with the Fw 190A. Later he was sent to Luben to train new Sturmgruppe pilots. In March 1945, he was transferred to III./JG 7 to fly Me 262 jet fighters from Lärz. On 10 April 1945, he shot down a USAAF P-51 fighter with R4M rockets. It was his 17th and last victory. Walter Hagenah was credited with 17 victories in about 140 combat missions. He recorded six victories over the Eastern Front. Of his 11 victories recorded over the Western Front, nine were four-engine bombers.